The Straddle Options Strategy usually refers to a Long Straddle and is a non-directional trade where both a put and a call are purchased simultaneously. Unlike most Spreads, which are usually composed of a Long and a Short Leg, the straddle is Long only. This means it has both limited risk and unlimited profit. These advantageous characteristics come at the expense of probability of success, however, which is generally lower with Long straddles because the break even point from the trade needs to cover the Premium from both the Long Put and call purchased to create the position. There needs to be a significant movement in the Underlying asset or commodity (i.e. high Volatility) to offset losses sustained in the side which ends up Out Of The Money. Straddles are sometimes used as news-related trades (e.g. company earnings announcements or the publication of economic data) where large movement is anticipated but the direction is uncertain. If the anticipated Volatility does not materialise, Volatility will not expand and the price of both Options will also not increase sufficiently to break even. It is sometimes possible to close the losing side of a straddle trade more quickly to reduce the losses incurred (once the prevailing direction becomes clear). This is difficult to execute, however, because the price of the Out Of The Money option will usually have reduced considerably by the time the order to sell is filled. The Straddle has many similarities with The Strangle whichis the same strategy, except using Out Of The Money instead of At The Money Options. Net debit to initiate straddle =$300. SteadyOptions.com webinar on earnings plays using straddles. See also the TastyTrade.com video which has a slightly different take. 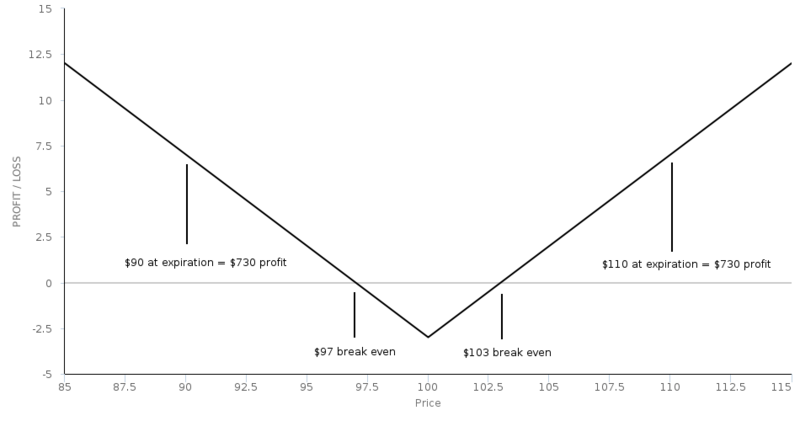 The Options Guide description of a long straddle trade (with an example). Article discussing straddles and earnings-related trades. TastyTrade.com video which argues that long straddles are usually unsuitable as earnings trades. Contrast this with the SteadyOptions.com video to get a balanced perspective on long straddles. OptionAlpha.com video describing why long straddles are poor trades when implied volatility is high.